RUPES BigFoot Mille LK 900E Gear Driven Orbital Polisher & Foam Pad Kit lets you choose 3 RUPES BigFoot Coarse, Fine or Ultra Fine Gear Driven Mille Foam Polishing Pads to meet your polishing needs. The RUPES BigFoot Mille LK 900E Gear Driven Orbital Polisher sets the standard for quality, efficiency, powerful performance and bridges the gap between rotary and dual action polishers. RUPES BigFoot Blue FoamCoarse Gear Driven Mille Foam Polishing Pad when used with RUPES Polishing System will remove deep scratches, swirl marks, etching and heavy oxidation. RUPES BigFoot Yellow Foam Fine Polishing Gear Driven Mille Foam Polishing Pad when used with RUPES Polishing System will remove moderate defects, swirl marks, oxidation and scratches in painted surfaces. RUPES BigFoot White Utra Fine Polishing Gear Driven Mille Foam Polishing Pad when used with RUPES Polishing System will final finish polish for depth, shine & color on painted surfaces. 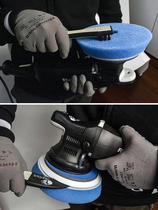 RUPES BigFoot Claw Pad Removal & Cleaning Tool offers a unique pad removal tool to more efficiently and safely remove RUPES Foam & Microfiber Polishing Pads from the RUPES Backing Plates without the worry of damage to the backing. On the opposite end you will find a unique brush to remove polishing compound build-up during the polishing process. 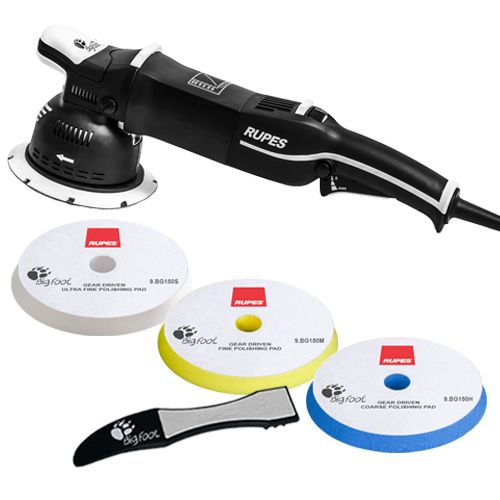 RUPES BigFoot Mille LK 900E Gear Driven Orbital Polisher offers a clockwise rotation as well as increased control and ergonomic comfort while delivering unmatched results. The distinctive clockwise rotation also restricts unwanted lateral movement found to cause fatigue in other polishers that feature a counter-clockwise design. The RUPES BigFoot Mille LK 900E Gear Driven Orbital Polisher offers Precise control at your fingertips with the with a variable speed dial for exact speed adjustments as well as a progressive trigger for precise control without interruption during your polishing process. 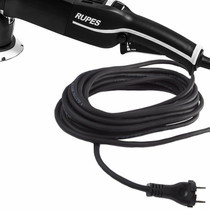 Innovation does not stop with machine performance, RUPES BigFoot Mille LK 900E Gear Driven Orbital Polisher comes equipped with a 20.52 foot cord for maneuvering within the work space, eliminating the mess of extension cords. RUPES BigFoot Coarse Gear Driven Mille Foam Polishing Pad when used with recommended RUPES Polishing Compound will remove deep scratches, swirl marks, etching and heavy oxidation. RUPES BigFoot Medium Gear Driven Mille Foam Polishing Pad when used with the recommended RUPES Polishing Compound will remove moderate defects, swirl marks, oxidation and scratches in painted surfaces. Clean dried polishing compound from RUPES BigFoot Mille Foam Polishing Pads during use with RUPES Claw Pad Removal & Cleaning Tool. RUPES BigFoot Mille Foam Polishing Pads should be washed after use with a mild soap and water by hand or in a washing machine. DO NOT USE Fabric Softener. Air or machine dry RUPES BigFoot Mille Foam Polishing Pads on delicate cycle with no or low heat. DO NOT USE dryer sheets.